"I am more than satisfied with this dog pedigree software!" S. Thomas breeder of German shepherds, Perth W.Australia. 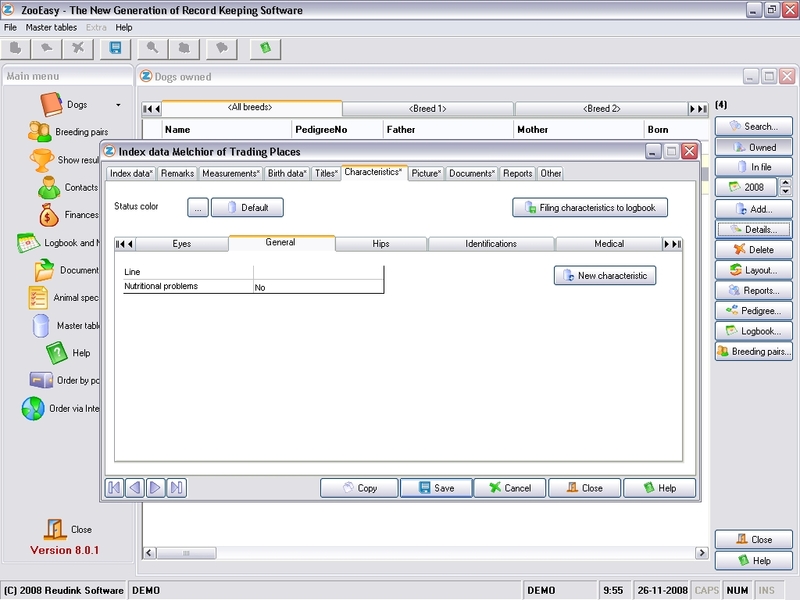 ZooEasy Dog Pedigree Software - the ultimate tool for canine breeders! 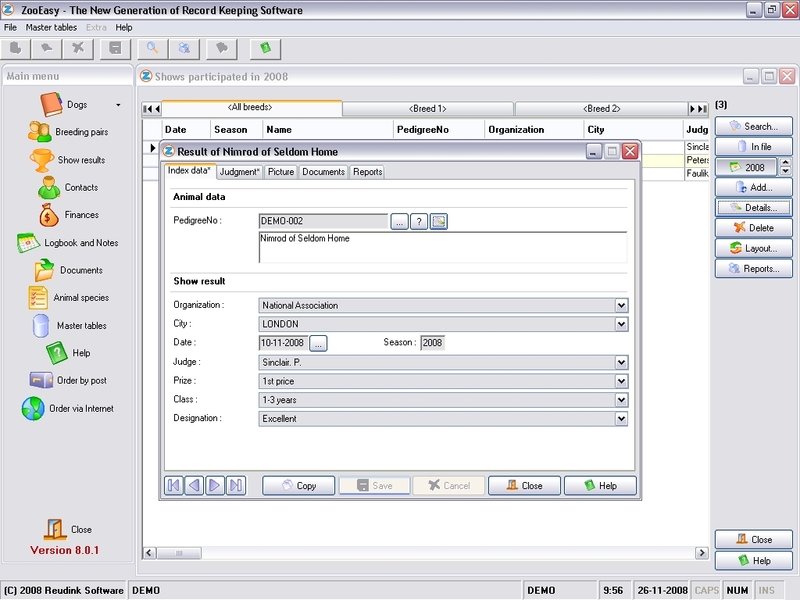 Easily create a professional digital record of all your dog breeding data with ZooEasy Dog Software. 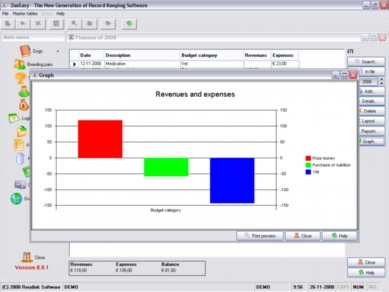 The ideal computer program for making dog pedigrees, selecting breeding pairs and recording medical results and genetic information of your dogs. ZooEasy Dog Software supports responsible breeding of German Shepherds, Poodles, Yorshire Terriers, Labradors, Golden Retrievers, Beagles, Bulldogs and all other dog breeds. ZooEasy Stand Alone is installed on your own pc. Would you prefer to work online? Click here. Also suitable for members of dog associations and clubs such as FCI, AKC, UKC, CKC (USA),The Kennel Club UK, ANKC and CKC (CA). Suitable for dog breeders and dog enthusiasts of all dog breeds. Create a clear overview of all your dogs and their characteristics such as temperament, character, appearance, color, behavior, measurements and titles. Also record genetic information and traits, litter and birth data, ancestors, descendants and further blood relationships. Multiple digital pictures and documents, such as health certificates, can be added. 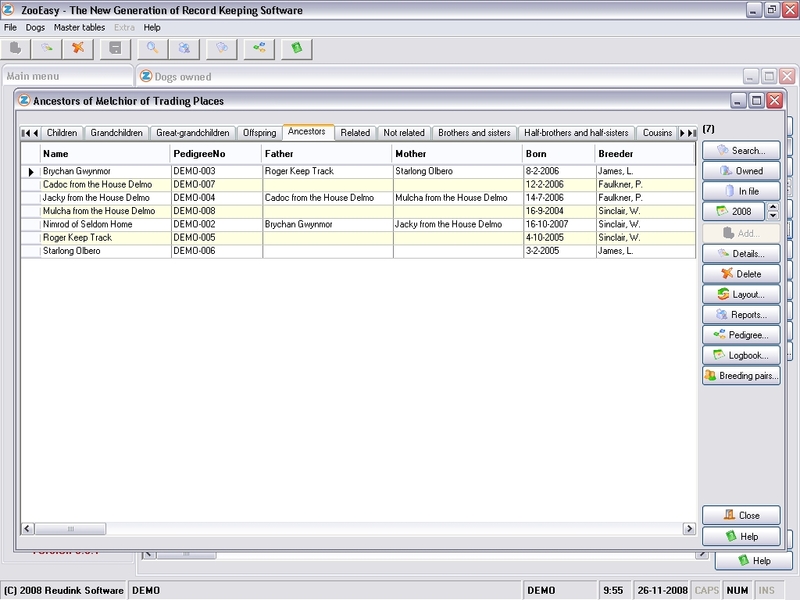 Reports of all dog data can easily be created, selected and sorted. We know how important perfect breeding results are. Therefore, we have made it easy to select the best breeding pairs using relationship percentages and the calculation of inbreeding coefficients. ZooEasy dog software thereby helps to prevent inbreeding in your lines and enables you to breed dogs in a responsible manner, ensuring genetically healthy offspring. 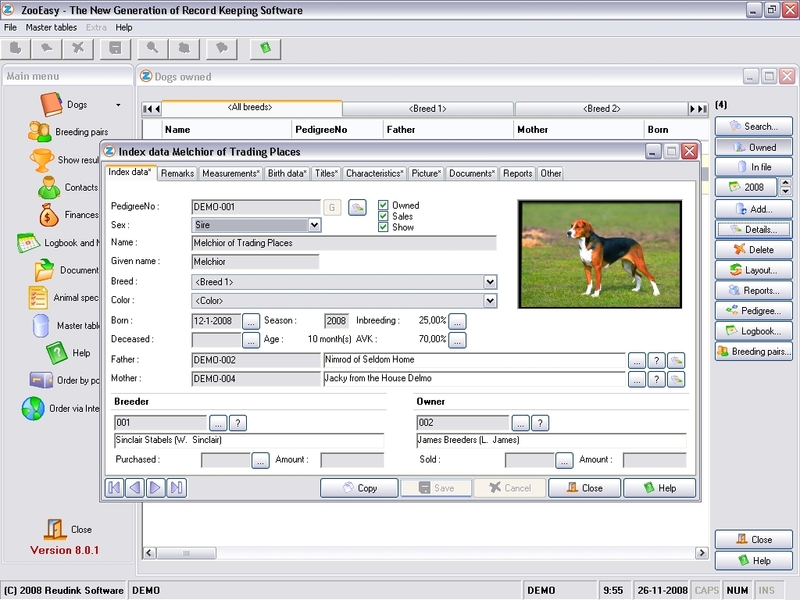 ZooEasy dog pedigree software also lets you add dogs from other breeders to perform cross breeding. Record all your dogs medical results such as eye and elbow examinations, shots, hip dysplasia and other medical checks. 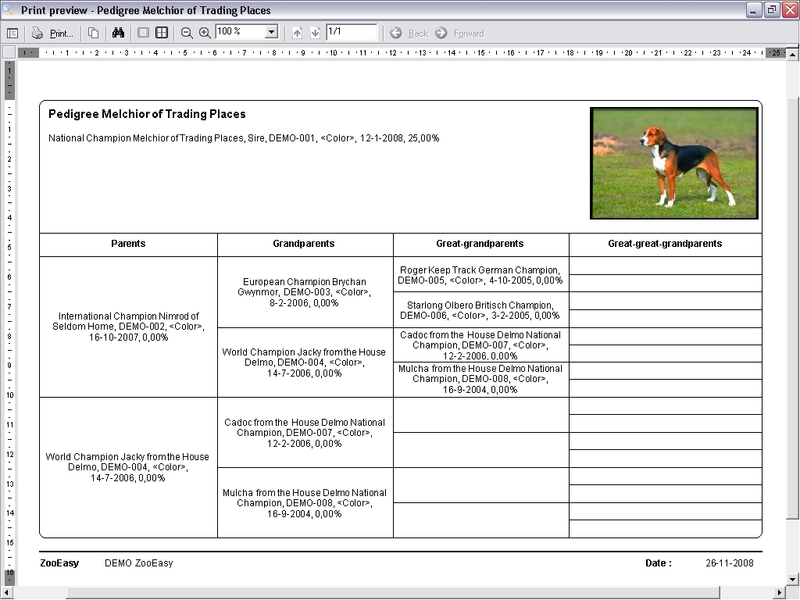 Moreover, the finest dog pedigrees can be created and printed. ZooEasy dog pedigree software has clever and easy to use search options, allowing you to select the most compatible dogs for breeding, based on temperament, health or beauty characteristics. Centralize the contact details of your entire network including customers, other dog breeders, suppliers and others. 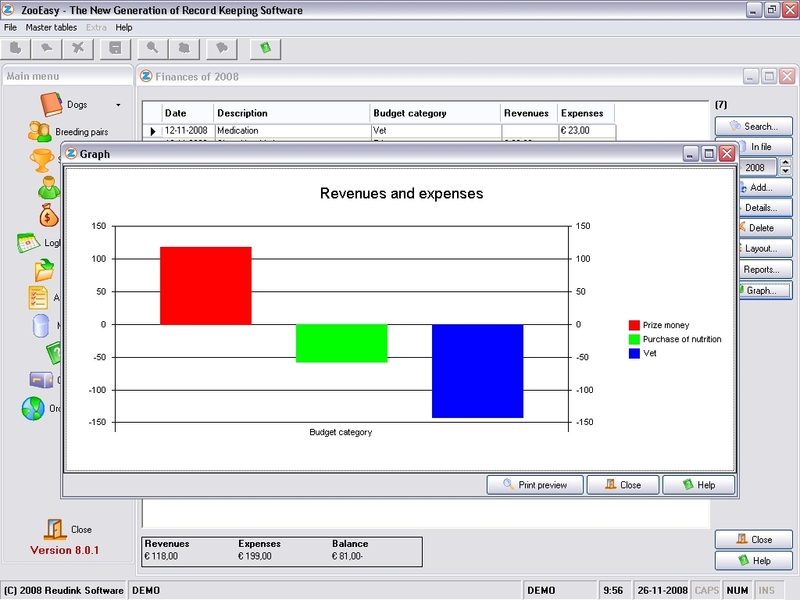 Manage the finances of your dog breeding by keeping an eye on expenses and revenues. In addition, maintain a record of performance in dog shows and prizes won. ZooEasy dog pedigree software is easy to use and allows you to develop a complete digital record of all your dogs. Regardless of whether you are a breeder of German Shepherds, Golden Retrievers, Spaniels, Bulldogs, Poodles, Yorshire Terriers, Labradors, Beagles, Bulldogs or any other breed of dog; ZooEasy pedigree software for dogs is an indispensable aid for all canine breeders and owners. Breeding dogs was never made this easy! ZooEasy is well established in the canine breeding industry and currently serves over 12,000 clients worldwide. The program is used by many individual dog breeders but also by dog breeding clubs and associations. Our annually conducted customer survey indicates our customers are more than satisfied with our dog software and company. ZooEasy is known for excellent product support and outstanding service. 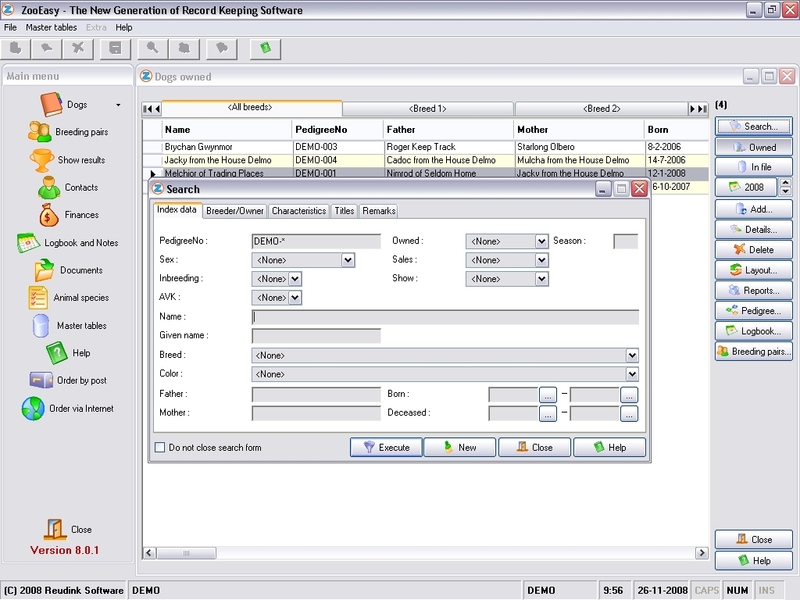 With a professional helpdesk and easy to use manual, dog pedigree software could not be made easier. If you have any questions please do not hesitate to contact us or call us at +31 (0)85 303 29 90. ZooEasy dog breeding software is available in CD-Rom and download version. Both can be ordered online in 5 simple steps by clicking here.